A.L. White Teff is the variety most widely used for making injera bread in Ethiopia. It can also be used in general breadmaking and cooking up as a hot cereal. It is gluten fee and very nutritious. It also makes superb tortillas and wraps. I found this variety to be more productive than the Brown Teff, although the brown variety is more nutritious than the white. Again, teff is one of my favorite cereal crops to grow here in Northern Indiana. The white teff even grew back after harvesting and I was able to get a second smaller harvest of grain. I recommend starting your plants indoors for 4-5 weeks before setting out after frost in late May. Teff can be direct seeded but the tiny seeds are difficult to sow evenly, and weeds (especially grasses) could quickly become a competitive problem for the tiny teff seedlings. I transplant about 1 foot apart in beds. 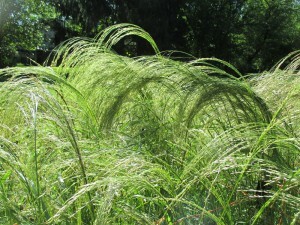 The plants grow to 3 feet tall and bush out as they produce tillers. I strongly recommend tying the plants up by setting stakes around your bed’s perimeter and running twine around the outside as well as from side to side, across the bed. It is important to do this before irrigating the maturing plants as they lodge very easily. 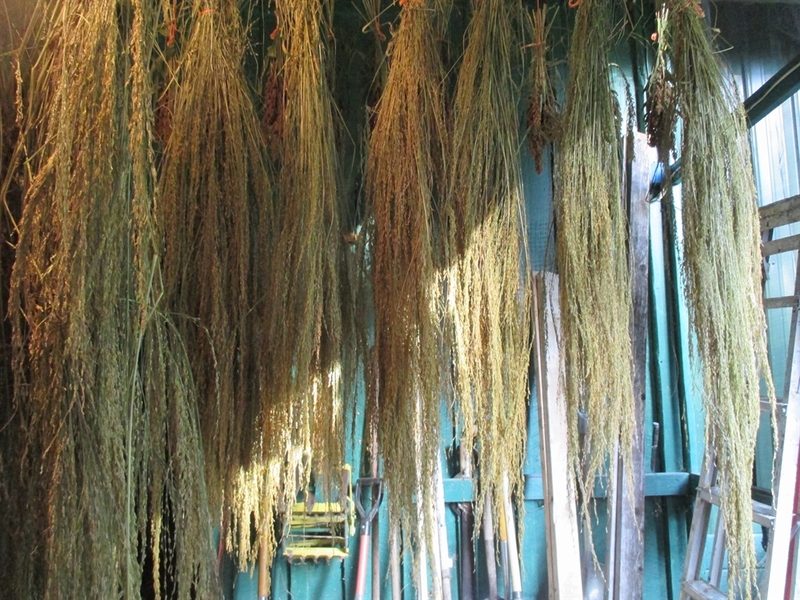 Lodging is when the plant falls over and can make a clean, easy harvest next to impossible. It is important to remember that teff is adapted to growing in an arid, hot climate with little or no rain. 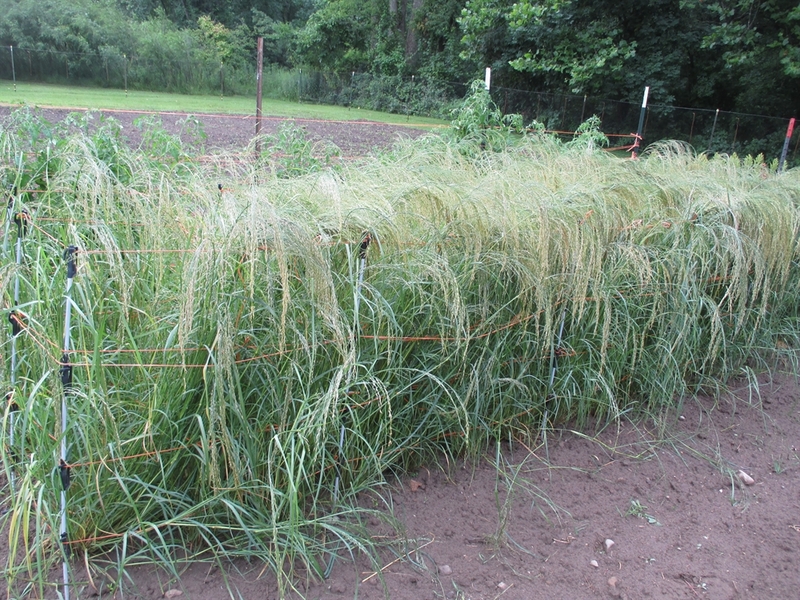 A mid-summer Indiana thunderstorm could flatten your whole crop to the ground. This also plays a part in determining when and how to harvest. Teff, like quinoa and amaranth, has special harvesting needs when grown in our region. Summer rains, aside from causing the plants to lodge can also make harvesting difficult if handled the same way you would in an arid climate. 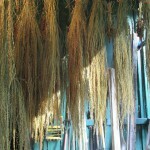 In Ethiopia, the plants are allowed to mature fully and dry out somewhat, like wheat, before cutting. This will not work well when you have a rainy summer. 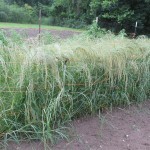 A good solution is to cut your plants while they are still green, as long as most of the seed heads are close to maturity, and hang them to dry for a few weeks in a well-ventilated place, like a barn or shed. You will know the grain is getting close to maturity when you can rub the seed heads between your fingers and the tiny teff seeds easily dislodge from the plant. 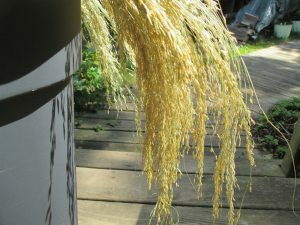 I thresh the grain free from the dried plants by rubbing the seed heads between the palms of my hands over a bucket or tub. 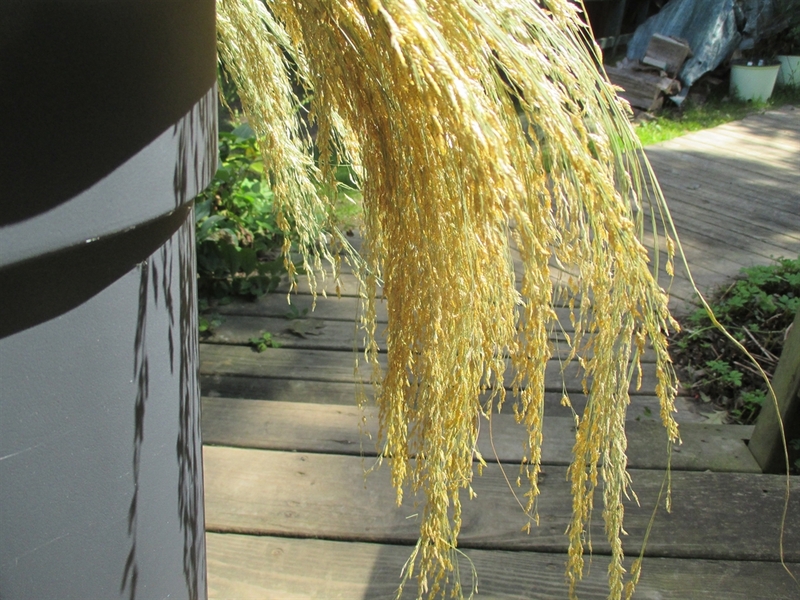 Winnowing can be a bit tricky as the grain is so light. Teff can yield up to a pound of grain for every 20 sq. foot. Possibly more with more intensive growing practices. I like to talk to somebody about the Teff seed and planting it or farming it can I get a phone number that I can call and contact someone kindly . experience growing teff in a large scale, farming operation. You can feel free to call me at 574-848-4625. Hi John, I noticed that the video you link to recommends a later planting window (June 15 – end of July). Have you tried a later planting date? Just wondering if it will still go to seed by the end of August. I’m also curious about density, as the agronomic per acre seeding rates I’m seeing are 7lbs/acre and up. That corresponds to ~1500 seeds per square yard. Even considering huge germination losses from broadcasting such tiny seed, it seems like you would end up with density closer than 12 inches. Thoughts? Hello Carla, I must confess that teff is one crop I have not experimented with beyond simply starting transplants and setting out in beds in late May. Given it’s earliness I would think planting at least till the middle of June would allow plenty of time for maturing. I have not tried broadcasting. The 12″ spacing was mostly for convenience and ease come spring when I am strapped for time to get all my crops planted. I can say that teff tillers like crazy. I was wondering how the plants would perform if given even more space between plants and approaching harvest as a 2 stage process. This would be an application for the homestead and not large scale production.